Electric Meat Slicers: Food Prep and Processors for Home Use, Slicer, Shredder, Tilt Stand | KitchenComforts.net. Fast, efficient slicing delivering sliced food directly to large trays or platters. This versatile, rugged electric food slicer for home use features a cool-running, high-torque electric motor and reliable, smooth gears for slicing with ease and confidence. Multi-purpose 7" stainless steel blade slices a wide variety of foods from deli thin to 3/4" thick slices. Special button secures food carriage in lock position to limit access to blade when unit is not in use. Some reviewers have stated that it is not as easy to clean as reported. Measures: 15" x 11" x 11"
Get meat sliced del-thin at home with this electric meat slicer. 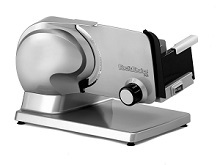 This home meat slicer by Buffalo Tools provides a 7.5" stainless steel blade with maximum slicing thickness up to 5/8". Non-slip suction cup feet keeps your slicer in place. Small and compact, easy to store and lightweight. 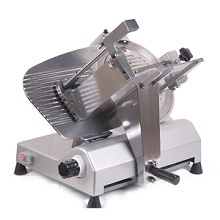 Speciality slicer great for the busy home cook or the sportsman in the family. Slice a wide variety of foods from deli-thin to approximately 1" thick slices. Slicer features include an intermittent "on/off" switch and a handy cord storage. Its large-capacity food carriage retracts fully to permit slicing of extra-large roasts, hams and other foods. All structural components made of cast aluminum and stainless steel. Features a powerful, cool-running, high-torque electric motor and reliable, smooth gears for slicing with ease and confidence. This food slicer has tilted food carriage and cantilever design for fast slicing. Easy home slicer for cheese, meat and more. Large, easy to use slice control knob for 1/32 to 1/2 inch thick slices. 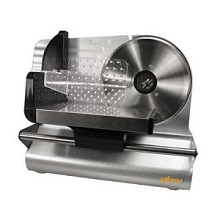 This slicer has a heavy-duty 130 watt internal motor. 7.5 inch stainless steel spinning blade. Dimensions: 11.2" H x 11.2" W x 17.5" D.
Cast aluminum housing on this electric food slicer for home use with stainless steel blade. 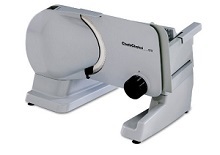 This Weston 7 1/2 inch meat slicer is high quality, quiet running and has a compact design. The food pusher with teeth controls slicing. Slice meat, cheese and more. Sturdy base and suction cup feet for stable and safe operation. Adjustable thickness settings from deli thin to over 1/2" thick. Some customers report that this unit is hard to clean. With this popular slicer / shredder you can slice or shred vegetables, fruits and cheese for delicious salads, tacos, soups, desserts, pizzas and more. 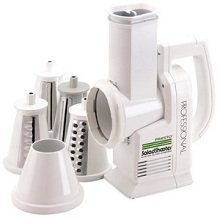 Includes 4 interchangeable cones for making regular slices, thick slices, ripple cuts and shreds and a handy funnel guide. Chops nuts, grates chocolate and even makes bread and cracker crumbs. 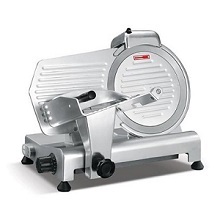 Makes regular slices for salads, thick slices for apple pie, shreds potatoes for hasbrowns and cheese for pizza. 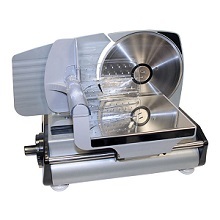 The Presto PS-10 anodized aluminum meat slicer has a 10" diameter blade. Slicing carriage can accommodate meat pieces up to 8 x 7.5 inches. Made of anodized aluminum for corrosion resistance. Built-in sharpener and ring guard for safety. Permanently lubricated carriage ball bearings for quiet operation. This slicer is not designed for cheese slicing applications. This versatile home food slicer is perfect for meats, vegetables, cheeses, fruits, bread and more. A thickness adjustment knob permits paper-thin slices or slabs about 0.6" thick. The 100-watt condenser motor operates quietly and the carriage travel smoothly. 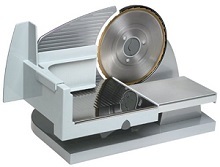 The slicer's 7" surgical stainless steel blade removes for cleaning and sharpening. 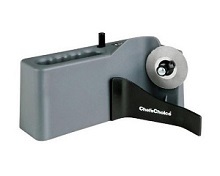 This Chef's Choice blade sharpener sharpens both serrated and non-serrated blades. Fits the M610 and 615 model. Black exterior with diamond abrasives. These cut resistant gloves are made of 100% DuPont Kevlar cut resistant fiber which provides excellent cut and slash resistance. The textured latex coated palm provides sure Grip and protects from puncture and abrasions. Coated with blue latex on palm, fingertips and thumb. 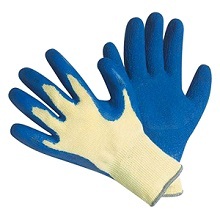 These gloves are perfect for cutting work and glass handling. This commercial semi-automatic slicer can slice massive boneless meat, including mutton, beef and venison. 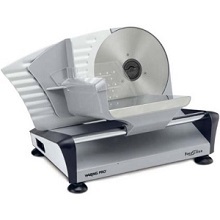 It can also slice ham, bread, cheese, vegetables, fruit and other foods up to 18mm slices. Skidproof rubber feet for table use. Low noise and durable metal body. Built-in dual whetstones for sharpening blade safely and conveniently. 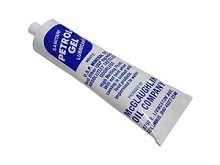 Extend your slicer and other equipment life with this McGlaughlin Oil PETROL-GEL. Cut maintenance cost by keeping your food slicer well oiled. This thick lubricant goes on clear and stays in place. You can use it on my meat slicer, meat grinder, sausage stuffer, kitchen aid stand mixer, blender, and other items. When traveling or camping out you may chose to sleep under the stars in the backseat of your SUV rather than fork out a lot of money for a hotel room or sleeping directly on the ground. You can get a comfortable night's sleep anyway if you use one of the inflatable air beds made specifically for the backseat or your car or SUV. Baby car seats will usually last through several babies, however the car seat cover may not even make it through one baby. Don't trash the whole car seat because it just needs a new cover. You may even want to change the cover to just get a different color or theme. Take a look at some of these popular car seat covers for baby. Having a fun outing on the water does not require a multi-thousand dollar boat. Today you can get some very durable inflatable boats and inflatable kayaks that are easy to tranport to and from your outdoor water location. Check out these Sevylor Inflatable Boats and Kayaks.